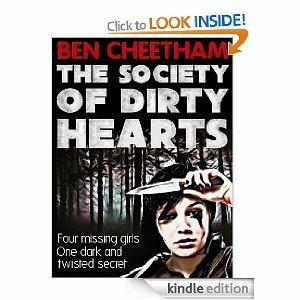 The Society of Dirty Hearts is the story of a young man's descent into obsession, addiction and depravity. Julian is a lad born with a silver spoon in his mouth. His father owns a long-standing shoe manufacturing company that has recently fallen on hard times. Julian wants for nothing and all should be well in his world. At the start of the story he is a personable and pleasant youth who you can't help but like. However, following a traumatic event in his childhood he is a troubled soul who is plagued by dreams in which he commits unspeakable acts of violence. Julian bumps into Mia, a fifteen year old girl that he feels inexplicably drawn to. In an attempt to understand this connection he spends time with her. She is a wild child with a dark past and events soon spiral out of control for both Mia and Julian. I am rapidly becoming a big fan of Cheetham's very accomplished narrative. This is the second of his works that I've read and I quickly became thoroughly immersed in the plot. Ben Cheetham has much in common with Allan Guthrie in that he seems to enjoy systematically destroying his characters one chapter at a time and like Guthrie he does this in a credible, believable and exciting fashion. I'm quite a canny reader and often guess the twist before it comes, not so with this novel. Cheetham kept the tension and suspense up right until the very last word. A thrilling exploration into the darkness that is held within us all. This is very much an adult novel in theme and content. I was left satisfied in the knowledge that I’d had a great read. I wouldn’t hesitate to recommend this novel to others. One to add to my ever growing TBR pile. Nice one, Daz. This is the second novel of Ben's that I've raced through. I'm sure you'll love it chaps.